Many birds need fresh water both for drinking and bathing and so providing water in your yard is a great way to help them. Here are some tips to help you provide birds with a safe, clean bird bath or pond. Remember you don't need to limit yourself to just one - put baths and ponds of different shapes and sizes so you can help all your neighbourhood birds. You will see different birds have different bathing styles. Parrots will throw themselves in and splash around whilst finches might flit in and out very quickly. Watch your bird baths and see how your birds use it. Remember birds are using this to drink AND bath in! 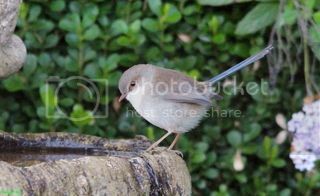 Replace the water every day or so and clean the bird bath regularly. Scrub and rise with clean water. If your bath is particularly dirty you can use a very dilute (20:1) water to bleach ratio - be sure to rinse very well after this. Place your bird bath so birds can perch nearby to observe the surrounding areas before bathing (so not in the middle of a patch of shrubs) but make sure there are dense shrubs or trees close by that birds can escape to if necessary. Ensure the bath is beyond the reach of cats - hang it from a tree or use a pedestal bath if cats are around. If you have no cats with access to your yard then even a pot saucer on the ground makes a suitable bird bath. If the bath is deep or has a smooth base (such as a glazed pot), place pebbles, a stick or a brick in it so that if a bird falls in it is able to grip on and climb out. As with bird baths, it is best if ponds have shrubs and plantings near by for birds to observe from, or escape to. Read up on the findings from the Bathing Birds project to uncover more about just which birds are using bird baths.